This smart four wheel rollator has been manufactured from aluminium, making it as lightweight as it is durable. And of course, due to the way it’s been constructed, it is easy to both transport and manoeuvre. 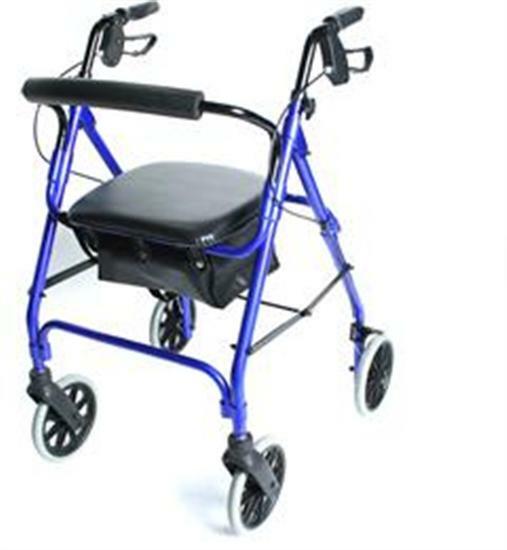 Its padded, high seat making it the ideal rollator for tall users, and being easy to collapse, fold and store make it something of an essential travelling companion. Puncture proof wheels mean that this can be taken over all sorts of terrain. Combined with the ergonomically designed comfortable hand grips, and cushioned safety bar and backrest, your only dilemma will be knowing when to stop! Rather more cumbersome than we thought. Difficult to keep folded when lifting in to car but seat is very accommodating and the adjustable height much appreciated. Prompt dellivery in good condition. Excellent product and quick efficient service.